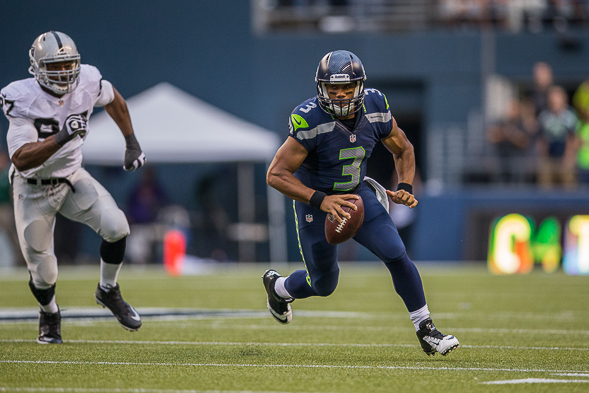 Thiel: Seahawks’ Wilson is hard. to. beat. Period. Sehawks QB Russell Wilson keeps doing the preposterous in big moments so often that it is time to expect them. That’s why I expect the Seahawks to beat the 49ers Sunday. Before the football madness reaches the threat level of flying purple monkeys, find a moment of quiet before Sunday’s kickoff to consider this stat comparison: The most amazing feat in the Seahawks’ 42-13 paddling of the 49ers in December was converting 11 of 13 third downs against a quality defense. Last week in the season opener in Carolina, the Seahawks converted 11 of 12 third downs. This should not be happening to a team whose quarterback hasn’t even played 20 NFL games. Again, Russell Wilson sledgehammers the actuarial tables. In the garrulous Carroll’s tsunami of soliloquies, that may have been the most trenchant point he’s made in his Seattle tenure. It’s that simple. G’night, everyone. Wait . . . it’s 49ers week. Let’s talk about it some more. “He keeps us in every game,” Carroll said after practice Friday. “He gives us a chance. He was doing that well (in college) before we got him. It was just whether we were going to pick him or not. He had shown everything that we see now. The preternatural ability to make something out of nothing seemed to reach its acme Sunday in Charlotte, when Wilson was chased 20 yards behind the line of scrimmage by the Panthers’ ferocious pass rush. Finally, on his third reversal of course, he stopped abruptly and whipped the ball almost 50 yards to the sidelines, where Doug Baldwin leaped to make a catch that still has Carolina fans spluttering. First freakin’ down when it should have been fourth-and-a-continent. Yet, thinking back to the December game, Wilson in the third quarter was sent backward by the 49ers about 20 yards, only this time after his third swerve-and-curve, he kept the ball and turned it into a six-yard gain. Ironically, he needed seven for the first down; besides a final-possession kneel-down, it was the only third-down play the Seahawks didn’t convert against the exasperated 49ers. The game-long, third-down conversions were stupendous, given the opponent. It even caused Wilson, always the soul of temperance, to gush. Another remarkable part of the outcome was that the Seahawks scored 42 points while Wilson threw only 21 times, completing 15 for 171 yards and four touchdowns (of nine, six, four and six yards). The only interception was off a tipped ball that hit RB Robert Turbin in the hands. That sort of efficiency bordered on the silly. Speaking of silly, that’s how the 49ers looked nine months ago chasing Wilson. After practice Thursday, Wilson was asked about his propensity for making fuzzy-bunny plays out of something that begins as a banana slug. “My dad used to tell me, ‘Big-time players make big-time plays in big-time situations,’” Wilson said. “For me, I live up to that. I’m waiting for that moment. I’m relaxed in those moments. I try to be the calm in the storm for all of the other guys in the huddle. I know that sounds like more of the Wilson-speak that we’ve all come to expect and enjoy. But re-read what he described, then think of how rare that must be to experience such trust and confidence in people, place and plan, so that concentration can be completely devoted to executing the immediate task. Wow. One time, please. Let me experience such a thing one time. So that’s why I’m picking the Seahawks to win, around 24-17. I think San Francisco will be better adjusted to the din than it was to the audio riot in December, particularly QB Colin Kaepernick, who had his worst game. I think the Seahawks played the most nearly perfect game of their 37 seasons against the Niners, a feat difficult to replicate. But in a key moment or two, Wilson will recall his father, his world will fall quiet, and he will do a thing that almost no one else can do in that same moment. If I didn’t keep seeing it, I wouldn’t believe it either. Carroll reported that DE Cliff Avril will see his first action as a Seahawk Sunday, fellow DE Chris Clemons practiced but will be a game-time decision and CB Brandon Browner will probably miss the 49ers. The latter would have been a good match for newcomer WR Anquan Boldin, the powerful vet who caught 12 passes for 208 yards against Green Bay last week. Avril is “ready to go” but may not start. Clemons is listed as questionable.